What's going on, you ask? Another busy month is coming to a close, so I thought I’d get you caught up before getting into a new post, especially since it's an important topic. I started a new semester at Wake Tech where I’m teaching the Cooking Fundamentals course as well as From Brunswick Stew to Manhattan Clam Chowder. The latter is an idea I’ve been kicking around and dabbling in for a while now. I’ve taught a couple of individual classes at A Southern Season on the topic and they were well received (they sold out, too!). So, I decided to dedicate a whole course to the subject. It’s been fun, challenging, and a great learning opportunity for me. I’ve also tried to embrace a few more social media sites; Twitter and Linked In specifically. I’m starting to wonder if I’m just wasting time or truly sowing seeds though. I also made the cover of the new A Southern Season CLASS booklet. 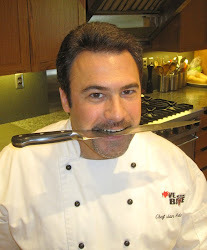 Come “Grill & Smoke” with me on 4/14/12 or bring your children for a Father’s Day special: “Dad and Me in the Kitchen” for some fun and tasty bonding on 6/10/12!